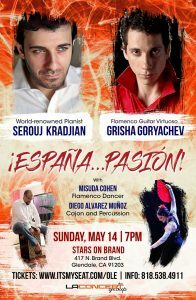 Home »Uncategorized»Serouj & Grisha – Espana …Pasion! Serouj & Grisha – Espana …Pasion! Experience the age-old music of fire and passion, in a way you have never heard before! A familiar art-form reveals fresh and unexpected facets as Russian guitar virtuoso Grisha Goryachev, pianist Serouj Kradjian, accompanied by Cajon and double-Bass, all on the same stage! The concert features classically flavored reinventions of guitar and piano pieces by the old flamenco masters. Evening will include specially arranged works of Paco De Lucia, Sabicas, Asturias, folk-tune surprises- all performed in this special fusion mix of flamenco and classical perfomers. A native of St. Petersburg, Russia, guitarist Grigory Goryachev has been acclaimed the world over for his blinding virtuosity and extraordinary musical sensitivity. As a master of both flamenco and classical styles, he has created a new genre all his own and garnered praise from such guitar luminaries as Paco de Lucia, Christopher Parkening, and Eliot Fisk. Canadian pianist and composer Serouj Kradjian has established himself as a versatile artist whose readiness to break boundaries and explore different styles has made him an exciting voice on the international music scene. His was described by The New York Times as a persuasive balance between elegance and spirit. His concerts have been broadcast by the CBC, Radio de la Suisse Romande, Radio and TV Espana, the BBC, the Suddeutsche Rundfunk and NHK Japan. Misuda has always had a special passion for dance and flamenco. As well as being professionally trained in classical ballet and contemporary dance, she has a BA degree in World Arts and Cultures (dance emphasis) from UCLA. She began studying classical ballet when she was 5 years old and became a member of the Los Angeles based-Westside Ballet Company. Los Angeles based Cajon and percussion master- known to be very vibrant on stage.